The purpose of the present study was to determine the absolute protein expression levels of multiple drug-metabolizing enzymes and transporters in 17 human liver biopsies, and to compare them with the mRNA expression levels and functional activities to evaluate the suitability of the three measures as parameters of hepatic metabolism. Absolute protein expression levels of 13 cytochrome P450 (P450) enzymes, NADPH-P450 reductase (P450R) and 6 UDP-glucuronosyltransferase (UGT) enzymes in microsomal fraction, and 22 transporters in plasma membrane fraction were determined using liquid chromatography/tandem mass spectrometry. CYP2C9, CYP2E1, CYP3A4, CYP2A6, UGT1A6, UGT2B7, UGT2B15, and P450R were abundantly expressed (more than 50 pmol/mg protein) in human liver microsomes. The protein expression levels of CYP3A4, CYP2B6, and CYP2C8 were each highly correlated with the corresponding enzyme activity and mRNA expression levels, whereas for other P450s, the protein expression levels were better correlated with the enzyme activities than the mRNA expression levels were. Among transporters, the protein expression level of organic anion-transporting polypeptide 1B1 was relatively highly correlated with the mRNA expression level. However, other transporters showed almost no correlation. These findings indicate that protein expression levels determined by the present simultaneous quantification method are a useful parameter to assess differences of hepatic function between individuals. Hepatic disposition and metabolism are key factors that determine interindividual differences in the pharmacokinetics of drugs. The uptake of most drugs from the circulating blood into the liver at the sinusoidal membrane of hepatocytes involves active transport. The drugs subsequently undergo biotransformation by intracellular enzymes such as cytochrome P450 (P450) and UDP-glucuronosyltransferase (UGT) enzymes, and the parent drug or its metabolites are eventually excreted from the hepatocytes by canalicular and/or sinusoidal transporter proteins. Therefore, the activities and expression levels of drug-metabolizing enzymes and transporters involved in these processes have been a focus of interest for pharmacokinetic research for a long time and have been analyzed in attempts to evaluate individual differences of hepatic disposition and metabolism (Shimada et al., 1994; Parkinson et al., 2004; Meier et al., 2006; Johansson and Ingelman-Sundberg, 2011). Assessment of activities of P450 enzymes is performed in vitro and in vivo by the use of specific probe substrates (Tassaneeyakul et al., 1993; Goldstein et al., 1994; Powell et al., 1996; Schmider et al., 1997; Kenworthy et al., 1999; Faucette et al., 2000; Li et al., 2002; Frye, 2004). However, the availability of suitable specific substrates for UGTs (Court, 2005), and especially for drug transporters, is still very limited. Although mRNA expression levels have been thoroughly analyzed, this approach suffers from the disadvantage that mRNA expression levels do not necessarily reflect protein expression or functional activity of the corresponding enzymes or transporters. For example, Sumida et al. (1999) have demonstrated that mRNA expression of CYP3A4 was well correlated with activity in human liver samples, whereas mRNA expression of CYP2E1 did not show such a correlation. Several other reports have demonstrated poor correlations between mRNA expression and activity of CYP2B6, CYP2D6, CYP2E1, and CYP3A4 (Rodríguez-Antona et al., 2001; Sy et al., 2002; Hayashi et al., 2011). Compared with mRNA, protein expression is considered to be a more suitable parameter of the functional activity of enzymes and transporters. Sy et al. (2002) have demonstrated that protein expression of CYP3A4 correlated well with activity but not with mRNA expression in human liver samples. Hayashi et al. (2011) also reported that protein expression of CYP2E1, but not mRNA expression, correlated with activity in samples of human intestinal tissue. Despite these advantages, the limited availability of specific antibodies, among other factors, has restricted quantitative analyses of drug-metabolizing enzymes and drug transporters at the protein level. To overcome these problems, we have recently developed liquid chromatography/tandem mass spectrometry (LC/MS/MS)-based protein quantification methods that do not require antibodies (Ohtsuki et al., 2011). In this method, the target protein concentration in a sample is determined after enzymatic digestion by quantifying one or more peptide fragment specific for the target molecule. Trypsin digestion is commonly applied for analyte peptide generation. Synthetic peptides of known concentrations are used as calibration standards, and stable isotope-labeled peptides are added to the samples as internal standards. Currently, 37 different proteins can be quantified simultaneously with high reliability and robustness (Sakamoto et al., 2011). We have previously reported the quantification of 34 transporter proteins in mouse tissues, 114 membrane proteins in human brain microvessels, 51 membrane proteins in monkey brain microvessels, and 11 P450 enzymes in microsomes of human liver autopsies (Kamiie et al., 2008; Ito et al., 2011; Kawakami et al., 2011; Uchida et al., 2011). Therefore, this novel protein quantification method can provide valuable data on absolute protein expression levels of drug-metabolizing enzymes and transporters, which should lead to a better understanding of hepatic disposition and metabolism of drugs. The purpose of the present study was to determine the absolute protein expression levels of 20 membrane-associated drug-metabolizing enzymes, such as P450s and UGTs, and 22 drug transporters, including those classified as key transporters by the International Transporter Consortium (Giacomini et al., 2010), in tissue samples of 17 human liver biopsies by using LC/MS/MS. Furthermore, mRNA expression levels and activities were measured and compared with protein expression levels to evaluate the suitability of protein expression level as a parameter for analyzing differences of hepatic metabolism among individuals. Substrates, metabolite standards, internal standards, and other chemicals were obtained from the following sources: acetaminophen, amodiaquine, dehydronifedipine, dextromethorphan, dextrorphan, diclofenac, 4′-hydroxydiclofenac, 4′-hydroxymephenytoin, 1′-hydroxymidazolam, 6β-hydroxytestosterone, NADPH, nifedipine, phenacetin, and testosterone were from Sigma Chemie (Deisenhofen, Germany). Bupropion was from LGC Promochem (Luckenwalde, Germany). Hydroxybupropion and [2H3]4′-hydroxymephenytoin were from Toronto Research Chemicals (North York, ON, Canada). [2H8]Hydroxybupropion, [13C6]4′-hydroxydiclofenac, and [2H6]dehydronifedipine were synthesized by Syncom (Groningen, the Netherlands). [2H4]Acetaminophen, [2H5]desethylamodiaquine, [2H3]dextrorphan, and [2H8]6β-hydroxytestosterone were from Cerilliant (Round Rock, TX). Desethylamodiaquine was from BD Gentest (Woburn, MA). S-Mephenytoin was from Enzo Life Sciences (Plymouth Meeting, PA). Midazolam (Dormicum) was from Roche Pharma AG (Grenzach-Wyhlen, Germany). [14C]Lauric acid was from American Radiolabeled Chemicals (St. Louis, MO). Other reagents and solvents used were from standard suppliers and were of reagent or HPLC grade. Preparation of Microsomal and Plasma Membrane Fractions. Frozen human liver tissue biopsy samples from 17 donors were purchased from XenoTech, LLC (Lenexa, KS) and UK Human Tissue Bank (Leicester, UK). Donor demographics are shown in Table 1. The research protocols for the present study were approved by the Ethics Committees of the Graduate School of Pharmaceutical Sciences, Tohoku University. The study has been carried out in accordance with the Declaration of Helsinki. Frozen liver tissues were dissected and homogenized using a Potter-Elvehjem homogenizer in buffer A [0.1 M KCl-phosphate buffer (pH 7.4) containing a protease inhibitor cocktail (Sigma-Aldrich, St. Louis, MO)]. Microsome preparation for P450 activity measurement was performed in the absence of protease inhibitors. For protein quantification, cells were additionally subjected to nitrogen cavitation (450 psi for 15 min at 4°C) in buffer A (Hunter and Commerford, 1961; Kamiie et al., 2008). The obtained homogenates were centrifuged at 10,800g for 20 min at 4°C, and the supernatants were collected and ultracentrifuged at 100,000g for 60 min at 4°C. The microsomal pellet was suspended in buffer A and ultracentrifuged at 100,000g for 60 min at 4°C. The resulting pellet was suspended in buffer B (20 mM Tris-HCl buffer containing 0.25 M saccharose and 5.4 mM EDTA), and part of the solution was stored at −80°C as microsomal fraction (Kawakami et al., 2011). The remaining portion was layered on top of a 38% (w/v) sucrose solution and centrifuged at 100,000g for 30 min at 4°C. The turbid layer at the interface was recovered, suspended in buffer B, and centrifuged at 100,000g for 30 min at 4°C. The plasma membrane fraction was obtained from the resulting pellet, which was suspended in buffer B. Protein concentrations were measured by the Lowry method using the DC protein assay reagent (Bio-Rad Laboratories, Hercules, CA) or using the bicinchoninic assay according to the manufacturer's protocol (Pierce Biotechnology, Rockford, IL). The plasma membrane fraction was suggested to contain canalicular membranes, because canalicular-localized transporters (MDR1, BCRP, BSEP, MRP2, and MATE1) were quantified in plasma membrane fractions of human and/or mouse liver in our present and previous studies (Kamiie et al., 2008). Furthermore, our previous manuscript demonstrated insulin-dependent subcellular translocation of low-density lipoprotein receptor-related protein 1 to plasma membrane of rat hepatocytes (Tamaki et al., 2007). The amount of low-density lipoprotein receptor-related protein 1 in rat liver plasma membrane fractions increased under the fed condition, whereas its amount in whole liver lysate was not affected. This suggests that plasma membrane was concentrated in the liver plasma membrane fraction, and intracellular membrane was less concentrated in the fraction. Protein quantitation of the target molecules was simultaneously performed by HPLC-MS/MS or nano-LC/MS/MS with multiplexed multiple reaction monitoring (MRM) as described previously (Uchida et al., 2011). Protein expression levels were determined by quantifying specific target peptides produced by trypsin digestion. Absolute amounts of each target peptide were determined by using an internal standard peptide, which is a stable isotope-labeled peptide with the identical amino acid sequence to that of the corresponding target peptide. The target peptide for quantification was selected based on in silico selection criteria as described previously (Kamiie et al., 2008, 2011). Quantification of human transporters and other membrane proteins was based on the MRM conditions reported previously (Kamiie et al., 2008; Ohtsuki et al., 2011; Sakamoto et al., 2011; Shawahna et al., 2011; Uchida et al., 2011). The peptide sequence for NADPH-P450 reductase (P450R) was FAVFGLGNK, and L was labeled with stable isotope. The MRM transitions for P450R were set as m/z 476.6, 635.4, 734.4, 488.3, and 805.5 for unlabeled peptide and m/z 480.1, 642.4, 741.4, 495.3, and 812.5 for labeled peptide (Q1, Q3-1, Q3-2, Q3-3, Q3-4, respectively). Protein samples were suspended in suspension buffer containing 7 M guanidine hydrochloride and 10 mM EDTA. Samples were reduced with dithiothreitol at room temperature for 60 min under a nitrogen atmosphere and S-carbamoylmethylated by iodoacetamide at room temperature for 60 min. The alkylated proteins were precipitated with a mixture of methanol and chloroform. The precipitates were dissolved in 6 M urea, diluted with 100 mM Tris-HCl (pH 8.0), and digested with tosylphenylalanyl chloromethyl ketone-treated trypsin at an enzyme/substrate ratio of 1:100 at 37°C for 16 h.
The tryptic digests were spiked with stable isotope-labeled internal standard peptides and acidified with formic acid for analysis with the nano-LC system or HPLC system, which was connected to an electrospray ionization triple quadrupole mass spectrometer [API5000 or 4000 QTrap (for CYP2B6 and CYP2C19); Applied Biosystems/MDS Sciex, Foster City, CA] operated in positive ionization mode. LC was performed with C18 capillary columns. Linear gradients of 1 to 45% acetonitrile in 0.1% formic acid were applied to elute the peptides at a flow rate of 100 nl/min for nano-LC and 50 μl/min for conventional LC. The mass spectrometer was set up to run a multiplexed MRM experiment for peptides. The ion counts in the chromatograms were determined by using the quantitation procedures in Analyst software (Applied Biosystems/MDS Sciex). One specific peptide was selected for quantification of each target protein and measured at four different MRM transitions. The amount of each peptide was determined as an average of three or four MRM transitions from one sample. In cases where signal peaks of less than three transitions were obtained, the amount of peptide in the sample was as defined as under the limit of quantification. The data of individual donors are presented as the mean ± S.E.M. of the values determined by using the different MRM transitions (Supplemental Tables S5 and S6). The data of 17 donors are presented as the mean ± S.D. of the mean values of individual donors. The absolute expression amount of CYP3A4 was calculated from the quantitative data obtained for a peptide generated from both CYP3A4 and CYP3A43 by subtracting the value obtained for a peptide that is specific for CYP3A43. Liver tissue biopsy samples were assayed for P450 activities by in vitro incubation of microsomal preparations. Assay details are provided in Supplemental Table S1. The substrate concentrations used were as high as possible, depending on the solubility in the assay buffer. The assay conditions, such as protein concentration, substrate concentration, and incubation time, were validated to provide linear enzyme kinetics. In general, microsomes were diluted with buffer (100 mM Tris, pH 7.4), magnesium chloride (5 mM), substrate, and NADPH (1 mM) at 4°C to a final incubation volume of 200 μl and warmed to 37°C in a 96-well temperature-controlled thermocycler (Biometra, Göttingen, Germany). The final solvent concentration (acetonitrile) was ≤1%. Incubations were terminated by heating to 80°C for 2 min, followed by cooling to 4°C. After centrifugation of the incubation mixture (20 min at 10,000g), 20-μl aliquots of the supernatants were diluted with 180 to 480 μl of quench solution (20% methanol or acetonitrile with 0.1% formic acid) containing the stable isotope-labeled metabolite as an internal standard. A 5-μl aliquot of diluted sample was directly injected into the LC/MS/MS system. Standard curve and quality control samples consisted of the same matrix as incubation samples. The following equipment was used for LC/MS/MS: HTS PAL autosampler (CTC Analytics, Zwingen, Switzerland), 1100 series binary pump and degasser (Agilent Technologies, Waldbronn, Germany), column switch thermostat Spark 880 (MayLab, Vienna, Austria), 4000 QTrap (Applied Biosystems/MDS Sciex) equipped with an orthogonal Turbo V ion source operated in negative or positive electrospray ionization mode. Chromatographic separation of incubation samples was performed on YMC-Pack ProC18, 50 × 2.1 mm, 5 μm (YMC Europe, Dinslaken, Germany) and X-Terra MS C18, 50 × 2.1 mm, 5 μm (Waters, Eschborn, Germany) analytical columns using validated methods. Integration of chromatograms as well as determination of peak areas was performed by Analyst software version 1.4.2 (Applied Biosystems/MDS Sciex). Formation of 11- and 12-hydroxylauric acid was monitored using HPLC on an X-Terra RP C18, 150 × 2.1 mm, 5 μm (Waters) analytical column, with a radioactivity detector (PerkinElmer, Dreieich, Germany). A 20-μl aliquot of the incubation supernatant was directly injected into the HPLC system. Integration of the chromatograms as well as determination of the peak areas was done by Chromeleon software (Dionex, Idstein, Germany). For additional calculations, data were transferred to Excel 2007 (Microsoft, Redmond, WA). TaqMan Reverse Transcription-Polymerase Chain Reaction Gene Expression Analysis. Total RNA from liver tissue was isolated using the RNeasy (QIAGEN, Hilden, Germany) protocol. Yield of extracted RNA was evaluated spectrophotometrically at 260 nm. Purity and integrity of RNA were assessed using a RNA 6000 LabChip with a 2100 Bioanalyzer (Agilent Technologies, Santa Clara, CA). For first-strand cDNA synthesis, 200 ng of total RNA was reverse-transcribed in a final volume of 20 μl following the protocol for the High Capacity cDNA RT Kit (Applied Biosystems, Foster City, CA). cDNA samples were diluted to 60 μl with water and stored at −20°C. Volumes of 1 μl of diluted cDNA were used for quantitative real-time polymerase chain reaction (PCR). P450 and UGT analyses were performed on a 7500 Fast Real-Time PCR System (Applied Biosystems), and transporter analyses were performed on an iQ5 Real-Time PCR System (Bio-Rad Laboratories). Assays were performed as technical triplicates. Inventoried assays as well as primer and probe sequences used in this study are provided as supplemental data (Tables S3 and S4). Gene expression data were normalized to β-actin as an endogenous control in the same sample [duplexed reverse transcription-PCR (RT-PCR)] or on the same plate for inventoried assays. Relative expression differences were calculated using the comparative ΔΔCt method, taking account of the actual PCR efficiency for each target and run. Protein Expression Levels of Drug-Metabolizing Enzymes in Human Liver Microsomal Fraction. Protein expression levels of 13 P450 enzymes, P450R, and 6 UGT enzymes were determined in human liver microsomal fractions from 17 donors (Table 1). As shown in Table 2, P450 enzymes could be quantified in liver microsomes from all 17 donors, except for CYP3A43 (n = 14) and CYP3A7 (n = 13). CYP2C9, CYP2E1, CYP3A4, and CYP2A6 showed the highest mean expression levels of more than 50 pmol/mg protein. The expression of enzymes was determined in microsomal fraction of human liver tissues from 17 donors. Each value represents the mean ± S.D. (n = 17). When the quantification value was under the limit of quantification, the value was taken as 0 pmol/mg protein for calculating the mean value of each protein. Amounts of CYP3A4 were determined by using the equation shown under Experimental Procedures. UGT1A4 was under the limit of quantification in all samples. CYP3A4 exhibited the greatest interindividual differences in protein expression level, with a 43.4-fold difference between the donors with the highest and lowest levels. CYP3A4 was expressed at high levels in donors 16, 1, 10, and 17 at 270, 202, 142, and 94.9 pmol/mg protein, respectively, whereas other samples showed levels in the range from 6.22 to 42.0 pmol/mg protein. High variation in protein expression (more than 10-fold) was observed for CYP2A6, CYP1A2, CYP2C8, and CYP2C19. CYP2C19 showed high expression in donors 1, 9, and 3 at 22.2, 12.9, and 10.1 pmol/mg protein, respectively, whereas the levels in other samples ranged from 2.08 to 4.31 pmol/mg protein. CYP3A5 showed high expression in only a single sample (7, 17.1 pmol/mg protein), whereas it showed lower expression in the narrow range of 2.48 to 3.61 pmol/mg protein in the other 16 samples. Among the UGT enzymes that were analyzed, the highest mean expression level was detected for UGT1A6, which also showed the highest interindividual variability of 6.2-fold. The other five UGT enzymes, 1A1, 1A3, 1A9, 2B7, and 2B15, were detected at more than 10 pmol/mg protein on average. UGT1A4 was below the limit of quantification (0.5 pmol/mg protein) in all samples. Except for CYP3A7, no significant correlation was observed between protein expression levels of enzymes and the age of liver tissue donors (data not shown). As shown in Fig. 1, one group of donors (1, 2, 8, 9, 10, 11, 14, 16, and 17) showed an age-dependent increase of CYP3A7 protein expression with a correlation coefficient of r2 = 0.973 by least-squares regression analysis, but the rest of the donors showed low and age-independent CYP3A7 expression. Age-dependent increase of CYP3A7 protein expression in human liver microsomal fraction. Age-dependent increase of CYP3A7 protein expression of nine donors (closed circles, 1, 2, 8, 9, 10, 11, 14, 16, and 17). Open circles, the lower expression of four donors did not correlate with age (5, 6, 7, and 15). Closed triangles, the data were under the limit of quantification (3, 4, 12, and 13). Each data point represents the mean ± S.E.M. of the values determined by using two to four different MRM transitions. No significant difference in any enzyme level was observed between smoking and nonsmoking groups. Significant gender difference (p < 0.05) was detected only in the expression of CYP3A43: 5.04 ± 0.62 pmol/mg protein in the female group (n = 9) and 3.04 ± 2.52 pmol/mg protein in the male group (n = 9). However, the mean CYP3A43 concentration in the group of female tissue donors was only 1.7-fold greater than that in the male group. Correlation of Protein Expression to mRNA Expression of Drug-Metabolizing Enzymes. Protein expression levels of 12 P450s and 5 UGTs were compared with mRNA expression levels (Table 3). For CYP3A4, CYP2B6, CYP2C8, and UGT1A6, a high correlation was observed with r2 values of more than 0.6 (in particular, r2 for CYP3A4 was 0.944). Many P450 enzymes that showed a high to moderate correlation between protein and mRNA quantities, such as 3A4, 2C8, 2C19, and 3A7, exhibited relatively similar 1/slope values from 26.2 to 57.1, suggesting similar protein/mRNA expression ratios among these enzymes. Figure 2 summarizes the data of individual samples and suggests a relatively narrow expression range of proteins but a wider expression range of mRNAs. For example, the mRNA level of CYP2B6 varied by over 3 orders of magnitude, whereas a range of only 3.7-fold was observed for protein concentration (Fig. 2A). There was a higher correlation between protein and mRNA expressions of CYP2B6 in the range of higher protein expression, but a lower correlation in the range of low protein expression, <7 pmol/mg protein (Table 3; Fig. 2A). Least-squares regression analysis was performed for protein expression levels (x-values, pmol/mg protein) against mRNA expression levels (y-values, relative amount to β-actin). Data points are shown in Fig. 2. Comparison between protein and mRNA expression levels of P450s and UGTs. A, high-correlated P450 enzymes. B, moderately correlated P450 enzymes. C, poorly correlated P450 enzymes. D, UGT enzymes. mRNA expression levels were quantified by quantitative RT-PCR, as described under Materials and Methods, and expressed as relative amounts to β-actin. Each data point represents the mean ± S.E.M. of the values determined by using two to four different MRM transitions for protein quantification and by three experiments for mRNA quantification. 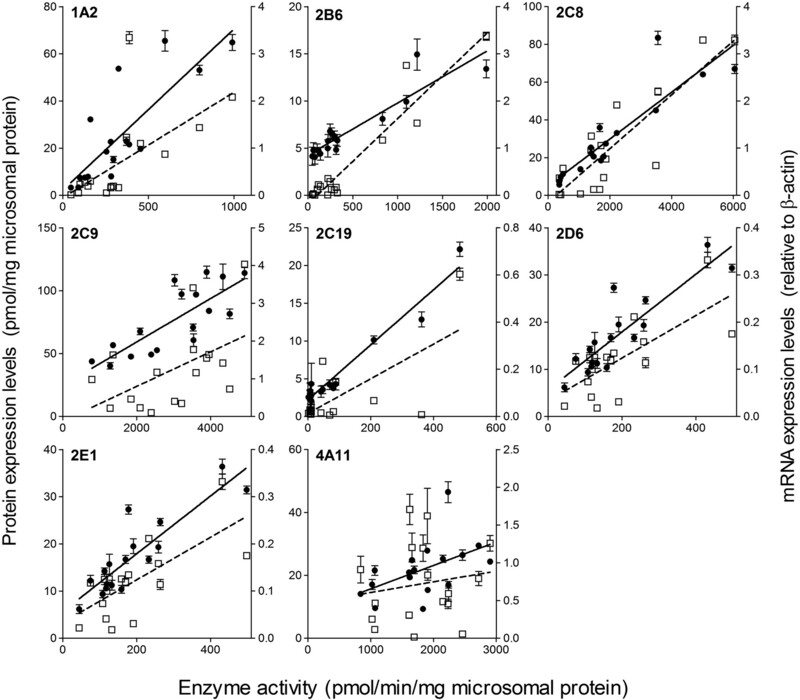 Correlation of Protein and mRNA Expression Levels with Enzyme Activities of P450 Enzymes. Enzyme activities of nine P450 enzymes were measured using human liver microsomes and specific probe substrates (see supplemental data). The enzyme activities (for absolute activity data, see supplemental data) are compared with protein and mRNA expression levels in Figs. 3 and 4 and Table 4. Except for CYP2B6, there was a better correlation of enzyme activity to protein expression than to mRNA expression (Table 4). In the case of CYP2B6, mRNA expression correlated slightly better with enzyme activity than it did with protein expression. The activities of CYP3A4 as determined with three different probe substrates, namely, testosterone, midazolam, and nifedipine, showed consistently high correlations to both protein and mRNA levels. However, in the low expression range, protein expression showed a better correlation to activity than mRNA expression (Fig. 4, bottom). Activity of CYP4A11, measured in terms of lauric acid 12-hydroxylation, was not correlated with either protein or mRNA level. Two distinct patterns of activity-to-protein correlation were observed. In the cases of CYP1A2, CYP2C8, and CYP3A4, the correlations are represented by lines with a y-axis intercept that is close to the origin, whereas a y-intercept clearly greater than zero was seen in the cases of CYP2B6, CYP2C9, CYP2C19, CYP2D6, and CYP2E1. 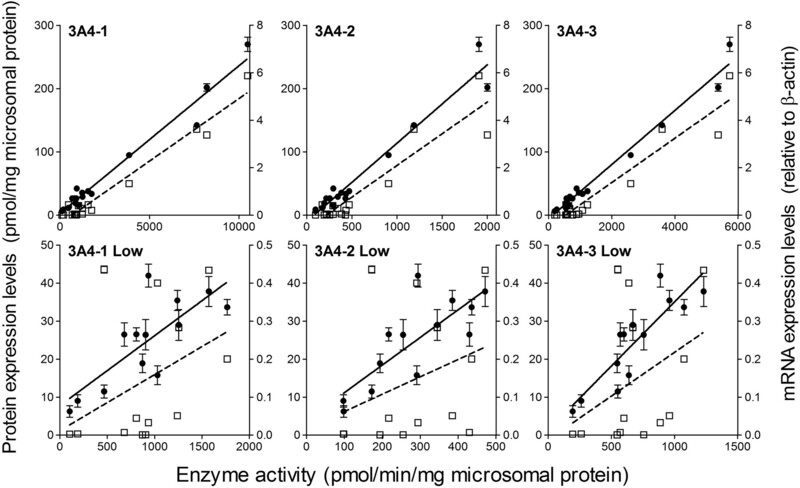 Correlation of enzyme activity with protein or mRNA expression of P450 enzymes. Closed circle and solid line, activity-protein expression correlation. Open square and dotted line, activity-mRNA expression correlation. Enzyme activities of CYP2E1 and CYP4A11 were determined in terms of activity for 11-hydroxylation and 12-hydroxylation of lauric acid, respectively. The correlation coefficients (r2) are summarized in Table 4. Each data point represents the mean ± S.E.M. of the values determined by using three to four different MRM transitions for protein quantification and by three experiments for activity assay and mRNA quantification. 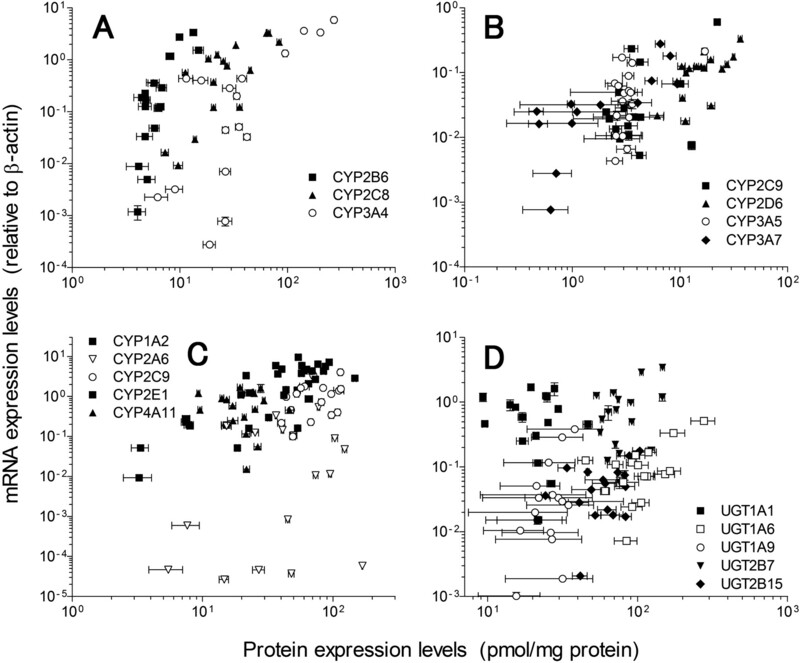 Correlation of enzyme activity to protein and mRNA expression levels of CYP3A4. Closed circle and solid line, activity-protein expression correlation. Open square and dot line, activity-mRNA expression correlation. The plots of CYP3A4-1, CYP3A4-2, and CYP3A4-3 show the activities measured using testosterone, midazolam, and nifedipine, respectively, as shown in Table 4. The bottom three plots are those in lower ranges corresponding to the top plots. The correlation coefficients (r2) are summarized in Table 4. Each data point represents the mean ± S.E.M. of the values determined by using three to four different MRM transitions for protein quantification and by three experiments for activity assay and mRNA quantification. Least-squares regression analysis was done for protein or mRNA expression levels (x-values) against enzyme activity (y-values). Enzyme activity of CYP2E1 and CYP4A11 was evaluated in terms of 11-hydroxylation and 12-hydroxylation of lauric acid, respectively. Data points and regression lines are shown in Fig. 3. Protein Expression Levels of Transporters in Plasma Membrane Fraction of Human Liver Tissue. Protein expression levels of 30 transporters and two membrane marker proteins were assessed. As shown in Table 5, 22 transporters and two membrane marker proteins could be quantified, whereas the protein concentrations of eight transporters, ABCA2, ABCG8, OATP1C1, OATP4C1, CNT3, PEPT1, OSTα, and OSTβ, were below the limit of quantification (<0.1–0.6 pmol/mg protein). The highest average expression levels, which exceeded 5 pmol/mg protein, were detected for OCT1, ABCA6, and NTCP. The largest interindividual differences among the 17 samples were observed for MDR3 (8.4-fold) and OCT1 (5.8-fold). The expression of transporters was determined using the plasma membrane fraction of human liver tissue from n = 17 donors. Data represent mean ± S.D. In the case of <LOQ, a value of 0 pmol/mg protein was taken for calculation of the mean. Among the group of canalicular-localized transporters, the mean expression levels of all detected transporters except BCRP were similar at 1.07 to 1.88 pmol/mg protein. In contrast, BCRP expression was only one third to half of those of the other canalicular transporters. With regard to the group of sinusoidal membrane transporters, four MRPs and three OATPs were detected. MRP1 and MRP4 were quantifiable in only 15 and three samples of 17, respectively. In the three samples for which MRP4 could be quantified, a much lower expression of MRP4 was observed compared to the other MRP transporters. OATP1B3 could be quantified in all 17 samples, whereas OATP1B1 and OATP2B1 were detected in only eight and five samples, respectively. The levels in quantifiable samples were 5.82 ± 3.20 pmol/mg protein (n = 8) for OATP1B1 and 1.58 ± 0.93 pmol/mg protein (n = 5) for OATP2B1, indicating higher overall expression and larger variability of OATP1B1. Neither significant age dependence nor gender difference in expression was observed for the quantified transporters. MRP1, OATP1B3, and CNT1 expression levels were significantly elevated in smokers (n = 4) versus nonsmokers (n = 6), namely 4.43 ± 1.24 pmol/mg protein in smokers and 1.81 ± 1.23 pmol/mg protein in nonsmokers for MRP1 (p < 0.05), 2.22 ± 0.25 and 1.69 ± 0.31 pmol/mg protein for OATP1B3 (p < 0.05), and 0.905 ± 0.117 and 0.735 ± 0.111 pmol/mg protein for CNT1 (p < 0.05). 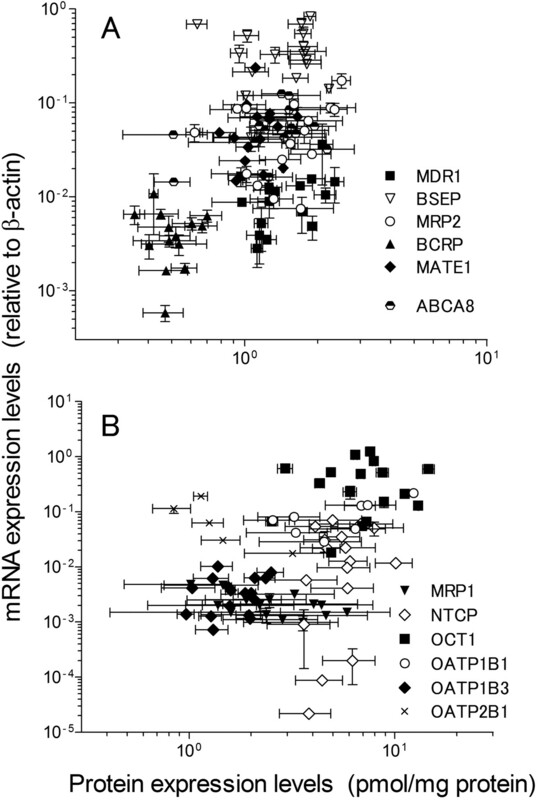 Correlation of Protein Expression to mRNA Expression of Transporters. Table 6 shows the correlation of protein expression levels of 12 transporters with their mRNA levels. Only OATP1B1 exhibited a substantial correlation between protein and mRNA with an r2 value of 0.727. This was also reflected by the 1/slope value of 59.3, which is similar to that found for CYP3A4. For the P450 enzymes, Fig. 5 shows a narrower range of protein concentrations compared with the larger range of mRNA expression levels. NTCP, for example, showed a 3 orders of magnitude variation in mRNA expression among donors, but only a 2.8-fold range of protein concentration (Fig. 5B, ♢). Least-squares regression analysis was done for protein expression levels (x-values, pmol/mg protein) against mRNA expression levels (y-values, relative amount to β-actin); each data point is shown in Fig. 5. Comparison between protein and mRNA expression levels of transporters. A, canalicular-localized and localization-unknown transporters. B, sinusoidal-localized transporters. mRNA expression levels were quantified by quantitative RT-PCR, as described under Materials and Methods, and expressed as relative amounts to β-actin. Each data point represents mean ± S.E.M. of the values determined by using three to four different MRM transitions for protein quantification and by three experiments for mRNA quantification. In the present study, we used LC/MS/MS to measure the absolute protein expression levels of 20 enzymes, including 13 P450s and six UGTs, in microsomal fraction, and 22 transporters in plasma membrane fraction from 17 human liver biopsy samples. P450 enzyme activities, assessed by the use of specific probe substrates, were well correlated with the P450 protein levels, except for CYP4A11 (Table 4). On the other hand, mRNA expression levels were less well correlated with enzymatic activities, except in the cases of CYP2B6 and CYP3A4, for which protein and mRNA expression levels were both highly correlated with functional activity. The present results clearly support the view that protein expression data are to be preferred over mRNA data for predicting the drug-metabolizing activity of P450s in liver tissue. CYP3A4 activity was well correlated with both protein and mRNA levels (Tables 3 and 4). These data suggest that mRNA expression of CYP3A4 can serve as a surrogate of enzymatic activity. However, in the lower range of expression, mRNA levels of CYP3A4 were less well correlated with activity (Fig. 4). Studies conducted at other laboratories have reported conflicting results on the correlation between mRNA expression and activity of CYP3A4 (Sumida et al., 1999; Rodríguez-Antona et al., 2001; Sy et al., 2002). These apparent contradictions may be explained by the expression-range-dependent correlation found here. Rodríguez-Antona et al. (2001) found a poor correlation between protein and mRNA expressions (r2 = 0.52) compared to the present result (r2 = 0.944). However, the range of CYP3A4 protein expression levels in their case was below 80 pmol/mg protein, which corresponds to the lower range shown in Fig. 4. Protein expression levels are determined not only by the level of transcription, but also by post-transcriptional processes, such as translation, translocation, protein stabilization, degradation, etc. Therefore, it is conceivable that the protein expression level of CYP3A4 in microsomes could be predominantly controlled by post-transcriptional processes in the low-expression range, whereas in the high-expression range, transcription becomes a major factor. The protein and mRNA expression levels of CYP2B6 also showed high correlations with activity, although the activity-to-protein expression regression line gave a y-intercept of nearly 5 pmol/mg protein (Table 4; Fig. 2). CYP2C9, CYP2D6, and CYP2E1 also showed highly correlated regression lines with a marked y-intercept. One of the possible explanations for this is the existence of nonactive forms of the enzymes, such as apoenzyme and/or inactivated enzyme. Hanna et al. (2000) reported that a band with lower molecular weight than the main band was consistently detected with anti-CYP2B6 antibody in all human liver microsome samples examined, and they suggested that it is likely to be nonactive CYP2B6. Relatively poor correlations of activity to protein and mRNA expression levels were observed for CYP4A11 (Table 4). Several possible reasons can be considered. One is lack of specificity of lauric acid 12-hydroxylation for CYP4A11. Castle et al. (1995) reported that additional P540 forms (e.g., CYP3A4) may catalyze the hydroxylation of lauric acid at the 12-carbon atom. Another possibility is instability of CYP4A11 activity and/or protein during microsome preparation and storage, because pronounced effects of storage on lauric acid 12-hydroxylation activity have been observed (Pearce et al., 1996). To our knowledge, the present study is the first to examine the protein-mRNA correlation of multiple drug transporters expressed in human liver (Table 6; Fig. 5). Except for OATP1B1, protein and mRNA expression levels of the investigated transporters were not well correlated. This finding is in contrast to P450 enzymes and may be explained by the prominent role of post-transcriptional processes and intracellular trafficking in controlling the protein levels of transporters in the plasma membrane (Marinelli et al., 2005; Gu and Manautou, 2010). Therefore, mRNA expression cannot be considered as a suitable surrogate for expression levels of transmembrane proteins in plasma membranes and, indeed, may be highly misleading. Because transmembrane proteins are partly localized to intracellular membranes, it remains possible that mRNA levels would correlate with their protein levels measured in whole tissue lysates instead of plasma membrane fractions. Although the number of samples examined was limited, the present study uncovered several interesting correlations of protein expression levels with donor status. The protein expression of CYP3A7 was highly correlated with donors' age in one group (Fig. 1). CYP3A7 is a major CYP3A enzyme in human fetal and neonatal liver, although it has been reported that high mRNA expression of CYP3A7 was found in approximately 10% of human liver samples (Burk et al., 2002; Stevens et al., 2003). 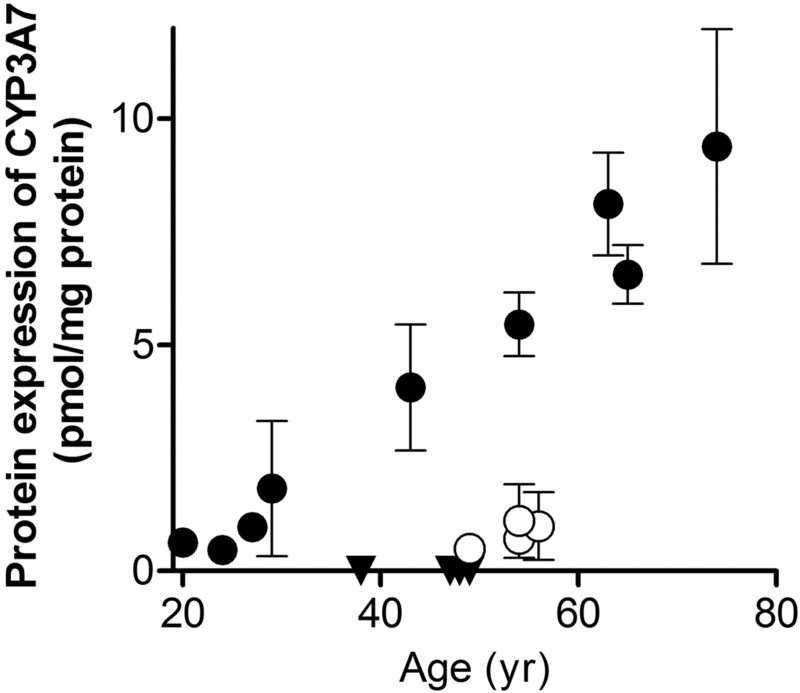 This result raised the possibility that CYP3A7 protein levels can be classified in high and low protein expression phenotypes, and the high expression phenotype may be manifested with increasing age. Further studies with larger numbers of donors would be necessary to evaluate age-dependent changes of CYP3A7 protein expression. The absolute expression profile of transporters revealed significant differences in the expression of MRP1, OATP1B3, and CNT1 between smokers and nonsmokers. The difference in the case of MRP1 was as high as 2.45-fold (Table 5). Because MRP1 is the most abundant MRP family member expressed at the sinusoidal membrane in human liver, the mechanism of its induction by smoking and its influence on hepatic metabolism would be worth studying in the future. UGT1A4 and ABCG8 proteins were reported to be expressed in human liver (Klett et al., 2004; Izukawa et al., 2009; Uchihashi et al., 2011). However, these molecules were not quantifiable in the present study (Tables 2 and 5). One possible explanation is that protein expression of these molecules was not high enough to be detectable by the present LC/MS/MS-based protein quantification and antibody-based assays have higher sensitivity. This possibility is supported by the result that ABCG8 protein was quantified in mouse liver using the same peptide as that used in the present study for human liver (Kamiie et al., 2008). In the case of UGT1A4, another possibility can be considered; the N-terminal 28 amino acids of UGT1A4 may serve as a signal peptide according to the UniProt database, and the peptide used for quantification is located in this region (from 4 to 11). Protein sequencing of purified rabbit liver UGT gave the N-terminal amino acid sequence of rabbit UGT2B16 corresponding to that just after the signal sequence (Li et al., 1997). Therefore, it is possible that the signal sequence in UGT is removed in human liver microsomes, so UGT1A4 lacks the sequence used for quantification. Differences in the quality of liver samples and in the sample preparation procedures may also affect quantitation results. The absolute amount profile of P450 enzymes in Table 2 matches that of commercial pooled human liver microsomes previously quantified by LC/MS/MS (Kawakami et al., 2011), and this result suggests that the microsomal fractions used in this study were of comparable quality to the commercial products. Furthermore, expression of Na+/K+-ATPase is widely used for normalizing protein expression (Tables 2 and 5). The maximal differences in Na+/K+-ATPase were 2.1-fold in microsomal fraction and 3.3-fold in plasma membrane fraction. Therefore, the influence of sample condition and preparation procedures on the observed protein expression is likely to lie within the range of variation of Na+/K+-ATPase expression. However, the average expression level of Na+/K+-ATPase in plasma membrane was less than that in microsomal fraction, even though Na+/K+-ATPase was expected to be concentrated in plasma membrane. It has been reported that Na+/K+-ATPase is internalized from plasma membrane of rat cholangiocytes under conditions of ATP depletion (Doctor et al., 2000). It is also expected that Na+/K+-ATPase would be internalized into hepatocytes during the processes of collection and storage, resulting in an apparently lower expression level in plasma membrane fraction. Although the above report demonstrated that ATP depletion did not affect sodium/glucose cotransporter 1 expression on the plasma membrane, an influence of sample condition on absolute amounts cannot be ruled out in the case of human tissue samples, and comparisons should be performed among human samples prepared and examined under conditions as consistent as possible. In conclusion, the present study showed that LC/MS/MS quantification of drug-metabolizing enzymes and transporters can provide information about expression levels, variability of expression and relationships of protein expression to mRNA expression, and functional activity. Quantitative data on enzyme and transporter expression are indispensable for advanced physiological pharmacokinetic modeling and may serve as a bridge between in vitro test systems and the intact organ. This study is only a first step in creating a broader database of enzyme and transporter expression levels. It needs to be expanded in several dimensions, e.g., by including additional molecular entities, increasing the number of biological samples, and examining internal and external influences on expression levels. Participated in research design: Ohtsuki, Schaefer, Ishiguro, Ludwig-Schwellinger, and Terasaki. Conducted experiments: Kawakami, Inoue, Liehner, and Saito. Contributed new reagents or analytic tools: Kawakami and Inoue. Performed data analysis: Ohtsuki, Schaefer, Kawakami, Inoue, Liehner, Saito, and Kishimoto. Wrote or contributed to the writing of the manuscript: Ohtsuki, Schaefer, Ludwig-Schwellinger, Ebner, and Terasaki. We thank Monika Schuster and Thomas Link for enzyme activity assessments, Ikue Kitahara for assistance with mRNA analysis, and Takashi Igarashi for collaborative support. This study was supported in part by grants for Development of Creative Technology Seeds Supporting Program for Creating University Ventures from Japan Science and Technology Agency (JST); Strategy Promotion of Innovative Research and Development from JST; and the Industrial Technology Research Grant Program from New Energy and the Industrial Technology Development Organization of Japan.
. (2002) Molecular mechanisms of polymorphic CYP3A7 expression in adult human liver and intestine. J Biol Chem 277:24280–24288. (1995) Human liver lauric acid hydroxylase activities. Drug Metab Dispos 23:1037–1043. (2000) ATP depletion in rat cholangiocytes leads to marked internalization of membrane proteins. Hepatology 31:1045–1054. (2004) Probing the world of cytochrome P450 enzymes. Mol Interv 4:157–162.
. (2010) Membrane transporters in drug development. Nat Rev Drug Discov 9:215–236. (2010) Regulation of hepatic ABCC transporters by xenobiotics and in disease states. Drug Metab Rev 42:482–538. (2011) Individual metabolic capacity evaluation of cytochrome P450 2C19 by protein and activity in the small intestinal mucosa of Japanese pancreatoduodenectomy patients. Biol Pharm Bull 34:71–76. (1961) Pressure homogenization of mammalian tissues. Biochim Biophys Acta 47:580–586. (2011) Quantitative membrane protein expression at the blood-brain barrier of adult and younger cynomolgus monkeys. J Pharm Sci 100:3939–3950. (2009) Quantitative analysis of UDP-glucuronosyltransferase (UGT) 1A and UGT2B expression levels in human livers. Drug Metab Dispos 37:1759–1768. (2011) Genetic polymorphism and toxicology–with emphasis on cytochrome p450. Toxicol Sci 120:1–13. (2011) inventors; Tohoku University, assignee. Method of quantifying membrane protein by using mass spectrometer. U.S. patent 7,901,942 B2, 8 Mar 2011; Japanese patent 4,670,060, 28 Jan 2011. (1999) CYP3A4 drug interactions: correlation of 10 in vitro probe substrates. Br J Clin Pharmacol 48:716–727. (2004) Localization of ABCG5 and ABCG8 proteins in human liver, gall bladder and intestine. BMC gastroenterology 4:21. (1997) Expression and functional domains of rabbit liver UDP-glucuronosyltransferase 2B16 and 2B13. J Biol Chem 272:3272–3279. (2005) Regulated vesicle trafficking of membrane transporters in hepatic epithelia. J Hepatol 42:592–603. (2006) Interindividual variability of canalicular ATP-binding-cassette (ABC)-transporter expression in human liver. Hepatology 44:62–74. (2004) The effects of gender, age, ethnicity, and liver cirrhosis on cytochrome P450 enzyme activity in human liver microsomes and inducibility in cultured human hepatocytes. Toxicol Appl Pharmacol 199:193–209.
. (1996) Effects of freezing, thawing, and storing human liver microsomes on cytochrome P450 activity. Arch Biochem Biophys 331:145–169. (1996) Identification of CYP4A11 as the major lauric acid omega-hydroxylase in human liver microsomes. Arch Biochem Biophys 335:219–226. (2011) Reliability and robustness of simultaneous absolute quantification of drug transporters, cytochrome P450 enzymes, and Udp-glucuronosyltransferases in human liver tissue by multiplexed MRM/selected reaction monitoring mode tandem mass spectrometry with nano-liquid chromatography. J Pharm Sci 100:4037–4043. (1997) Metabolism of dextromethorphan in vitro: involvement of cytochromes P450 2D6 and 3A3/4, with a possible role of 2E1. Biopharm Drug Dispos 18:227–240.
. (2011) Transcriptomic and quantitative proteomic analysis of transporters and drug metabolizing enzymes in freshly isolated human brain microvessels. Mol Pharm 8:1332–1341. (2002) Modeling of human hepatic CYP3A4 enzyme kinetics, protein, and mRNA indicates deviation from log-normal distribution in CYP3A4 gene expression. Eur J Clin Pharmacol 58:357–365. (2007) Insulin facilitates the hepatic clearance of plasma amyloid beta-peptide (1 40) by intracellular translocation of low-density lipoprotein receptor-related protein 1 (LRP-1) to the plasma membrane in hepatocytes. Mol Pharmacol 72:850–855. (2011) Quantitative targeted absolute proteomics of human blood-brain barrier transporters and receptors. J Neurochem 117:333–345. (2011) Metabolism of the c-Fos/activator protein-1 inhibitor T-5224 by multiple human UDP-glucuronosyltransferase isoforms. Drug Metab Dispos 39:803–813.